One year after a caliphate was declared spanning Syria and Iraq, there is little to celebrate — unless you're ISIS. Despite a massive international campaign to defeat the the brutal militants, ISIS has not only managed to hold onto the territory but has expanded its reach beyond those borders over the last 12 months. "It's been a great year for ISIS," according to Matthew Henman, head of IHS Jane's Terrorism and Insurgency Center. "This would be close to a best-case scenario for them." Majeed Al-Hamadani, a 43-year-old high-school teacher in Baghdad, agreed. "Nothing was changed during the past year," he told NBC News. "ISIS lost some territories but they were able to take over other areas. The Iraqi soldiers do not have the will to fight." The group burst onto the international stage when fighters bearing the black flag of ISIS seized control of Mosul, Iraq, in early June 2014. The Sunni militants had been mostly fighting in Syria before then, but the fall of Iraq's second city signaled the militants had bigger plans. Days later ISIS overran Saddam Hussein's birthplace of Tikrit, another major prize in what became a lightning advance through northern Iraq. June 29 marked another turning point: ISIS formally declared the establishment of a caliphate and their leader, Abu Bakr al-Baghdadi, as the caliph. In addition to consolidating territory, the group also wanted to consolidate their brand: Islamist terror. The Iraqi military proved ineffective against ISIS: many of its soldiers simply dropped their weapons and fled in face of the militants. It wasn't until August that the U.S. decided to intervene with airstrikes — spurred by fears ISIS would massacre minority Yazidis — and formed an anti-ISIS coalition. The total cost of U.S. military operations in Iraq and Syria — airstrikes, training and more — since then has reached nearly $3 billion, at an average daily cost of $9.1 million. But even amid the stepped up counterterrorism and counterinsurgency efforts, data shows ISIS attacks have continued largely unabated — helped by the fact that more people than ever are perpetrating violence in the group's name. ISIS has been "remarkably successful" over the past year and is "certainly stronger now than it was a year ago," Henman said. "When Mosul fell last year people were surprised, but I think people would have been more surprised if you'd said that a year later the group would still hold Mosul but would also hold Ramadi, as much territory as it is and be expanding further around the world," he added. "ISIS is super-coordinated." The IHS Jane's Terrorism and Insurgency Center has recorded 3,095 attacks and 6,546 non-militant fatalities caused by ISIS since the announcement of the caliphate at the end of June 2014. A further breakdown of figures shows that the number of attacks has held relatively steady month to month. ISIS mounted 210 attacks in July and 300 in August of 2014, according to data from JTIC. Both months saw more than 500 non-militant fatalities attributed to ISIS. Every month since has seen more than 220 attacks — often far more — with April and May of 2015 seeing 285 and 290 attacks respectively. Many thought that ISIS would be forced to change operational patterns — like using large convoys to attack — in the face of airstrikes, but that hasn't come to pass. While they've changed their approach somewhat, ISIS has still been able to mass enough fighters to overrun towns and bases, according to Henman. Ramadi and "countless other" towns and military bases have been overrun by "large gatherings of militants that you would think would've been prime targets for airstrike," Henman said. "That speaks a lot to the lack of coordination of Iraqi forces on the ground and coalition forces … There's a big disconnect there," he added. The more moderate rebel groups like the Free Syrian Army which initially sprung up to defeat Syrian President Bashar Assad have found themselves facing off against ISIS. Now, hundreds of groups operate under the FSA banner — including the 3,000-fighter strong Swar Army. It spokesman Ahmed Hisso told NBC News that while "you cannot deny the strength of ISIS," his fighters had achieved "important victories" against ISIS in recent months with the help of Kurdish fighters and the American coalition. "With the help of the U.S. coalition I believe that we will achieve great results in the coming period against ISIS," he said. However, Bassam Mustafa — whose Fastakim Union also fights for the FSA — said internal divisions have hindered any success on the ground. "You can't compare us with ISIS. ISIS fights under one flag while we are divided," he said. "The FSA groups are not organized till now, which is a very big problem, while ISIS is very [well] organized." He said his fighters need money, ammunition and weapons — a call echoed by other groups on the ground, including the Kurds. 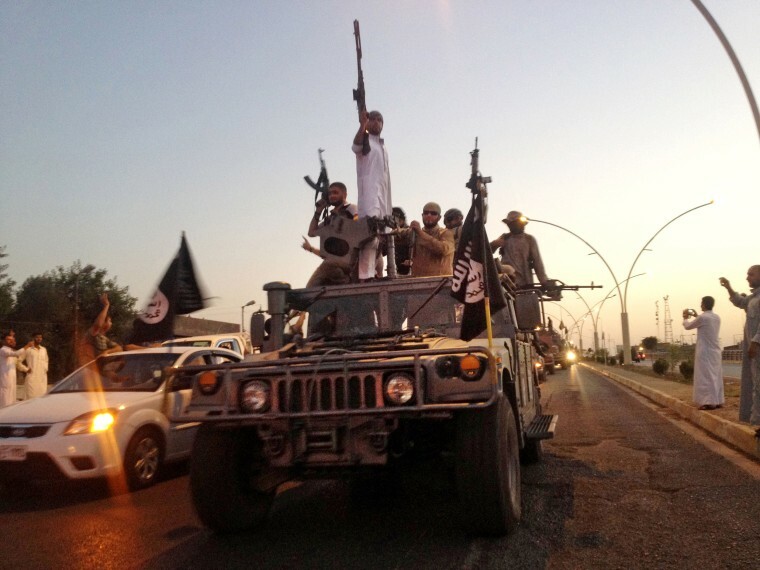 "ISIS has all of that — including the oil sources they took over in Syria and Iraq," Mustafa said. "It was a difficult year for us and we didn't achieve real successes against ISIS. The next years would be worse for us if the situation doesn't change and we get real and effective support from the Western countries, particularly from the United States. Our revolution is in danger." In Iraq, the military and the U.S. have traded blame — with Baghdad asking for more weapons and coordination to high-level American officials questioning Iraqis' will to fight. Local Sunni militias and Iran-linked Shiite militias are also involved in the effort, not to mention Kurdish forces heavily engaged in the battle. "In Iraq alone you have a relatively substantial array of actors who are fighting ISIS but the thing that is hobbling that effort — preventing it from having full effectiveness — is that there are political factors at play that divide these actors," Henman said. "The counterinsurgency is becoming bedeviled by these political issues." Plus, military action has had little impact on ISIS' own message which has been resonating globally. One year into the caliphate, ISIS continues to draw thousands of willing recruits to Iraq and Syria all while inspiring pledges of allegiance from jihadis around the world. "It's not necessarily that the coalition campaigns in Iraq and Syria aren't having any impact, but they're not doing anything to stop the spread of the group around the world, to stop the appeal of the group, to stop new groups joining all the time," Henman said. When ISIS declared a caliphate, the group was in control of a large swath of territory straddling Iraq and Syria. Now, there are ISIS affiliates in Egypt, Libya, Saudi Arabia, Yemen, Algeria and Pakistan. Fighters in Afghanistan have splintered away from the Taliban to wage war under the ISIS banner, while new "provinces" of the caliphate have cropped up in the Caucasus. Even Nigeria's Boko Haram terror organization wants in on the caliphate — the group has pledged allegiance to ISIS and many analysts think it's only a matter of time before ISIS formally pronounces a West Africa province. While the amount of territory ISIS controls in areas outside of Syria and Iraq is relatively small, in this case size might not matter so much. "It still allows them to present themselves as having that victorious momentum," Henman explained. "That momentum hasn’t been challenged or worn down. In all their propaganda, they can say. 'look, we're continuing to expand.'" Their arm of terror also has known no geographical bounds: the U.S., Britain and Japan have all reeled from the brutal beheadings of their hostage citizens by the militants and like many other nations have disrupted ISIS-inspired plots while trying to prevent returning jihadis from waging attacks on their soil. That's not to say that ISIS has been completely victorious this year. There have been some notable defeats, such as the high-profile loss of Kobani. However, in recent days fighting there has resumed and it appears ISIS might be making a play to retake the city. While ISIS was pushed out of Tikrit, the militants put up enough of a fight to show Iraqi forces and the U.S.-led coalition just how difficult a foe they would face in retaking other key cities such as Mosul. Bashar al-Sa'di's brother was killed died three weeks ago fighting against ISIS in Tikrit. "I am sad because I lost him, still I am happy because he died while defending Iraq and Iraqis," the 39-year-old told NBC News from Diyala province. He described Iraqi forces' defeat in Mosul and Ramadi as a "tactical withdrawal" and expressed hope that the two cities would be wrested from ISIS control. "We have the will to defeat ISIS, and we will do so," he told NBC News. Not everyone agrees. Omar Faisal, 40, fled his home in Fallujah after ISIS took Mosul out of fear the militants would overrun his city as well. "The news we heard about Iraqi forces leaving the city without fighting, dropping their weapons and uniforms to wear civilian clothes — I felt that this army cannot protect me and my family, so I decided to leave," he explained. He too said that "nothing is changed in the past year," which leaves him pessimistic for the future. "Still ISIS militants are strong and they were able to take over Ramadi… I do not think that the Iraqi government will be able this year to defeat ISIS." Henman, however, noted that while "the caliphate is strong, it's still very much in a state of flux." "Things could still fall apart," he said. But "it'd be a fancy to think that in a year's time the group could be completely rolled back and gone. The group can lose territory, it can be rolled back, the wings can be clipped to a certain extent… but the ideology they've created… That isn't going to go away. "They've now started something that is going to continue to be attractive that can't be killed in a conventional sense."